It's always a pleasure listening to a live set of smooth jazz sax man Ray Silkman. Saturday, Feb. 10th at Close-Up 2 (416 S. Clark) was no exception. Although it was cold and frigid outside, Silkman had the capacity crowd inside hot and torrid. Playing with a valiant spirit, Silkman's sidemen whipped up an interactive whirlwid behind him. 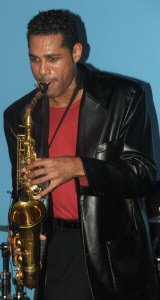 If you have yet to check out this brilliant, energetic saxophonist, you owe it to yourself to do so as soon as possible (www.raysilkman.com)Silkman's spirit is uplifting and can be felt throughout the room. 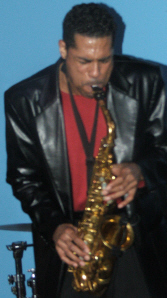 During this particular set, Ray was joined by longtime bassist Paul Richmond and drummer Hamisi Jackson, along with Tim Gant on the keyboard. Gant, a gifted pianist, demonstrated throughout the evening his solo ability, with strong phrasing that was built on rapid-fire lines and repeated licks with fleet-fingered fluidity. Bassist Richmond, as always, was very cool and stoic as he played deep bass tones with ease. Richmond has been playing with Silkman for many years and is a perfect complement to Ray's signature driving and bold attack of each note. Silkman, playing either smooth love ballads, or covering tunes of the late, great Grover Washington, Jr., is alwayscharismatic and easily connects with his audience. This evening, Silkman had the crowd on its feet all night long. Most performers rely on the feedback of the viewers for their energy. Tonight, Close-Up 2 was flowing with fire and exuberance. It was a pleasure to see this room full of life. Silkman opened Close-Up 2 in the fall in front of a sparse audience. If tonight was an indication, this downtown venue is here to stay. It's cozy, with lot of charm, and just the place for a downtown, after-work group, or those discriminating smooth jazz fans looking for a new and exciting venue. Check it out, you won't regret it (www.closeup2jazz.com). "Ray Silkman is sure to go places, I can feel his music"
"We have never seen the kind of response to a Jazz record as the one we have seen to Ray Silkman's So Saxual, whenever we play the song, the phones just light up with people asking, who is that and where can I get that song?" After an extensive search for this CD I finally found it here on Amazon.com. Before purchasing this CD I use to hear one of the songs played on the radio. The song "So Saxual" was only played once a week at midnight on a local station. I fell in love with that song so I had to have it. Loving the song meant purchasing the CD. Purchasing the CD gave me the opportunity to hear more songs from this artist. For the smooth jazz collectors this CD is a must have. It contains a mixture of slow and upbeat tempo music. The song "So Saxual" should be labeled for lovers only..if you get my drift. However the entire CD is pleasing to the ear. Since obtaining this CD I have become a fan and follower of the artist. If Ray Silkman comes to your area definitely check him out because he gives a great show. Plus you would hear his music come to life.